Venice Marco Polo Airport hall The airport of Venice “Marco Polo” is on Terra Firma or as the Venetians say: on the firm earth. 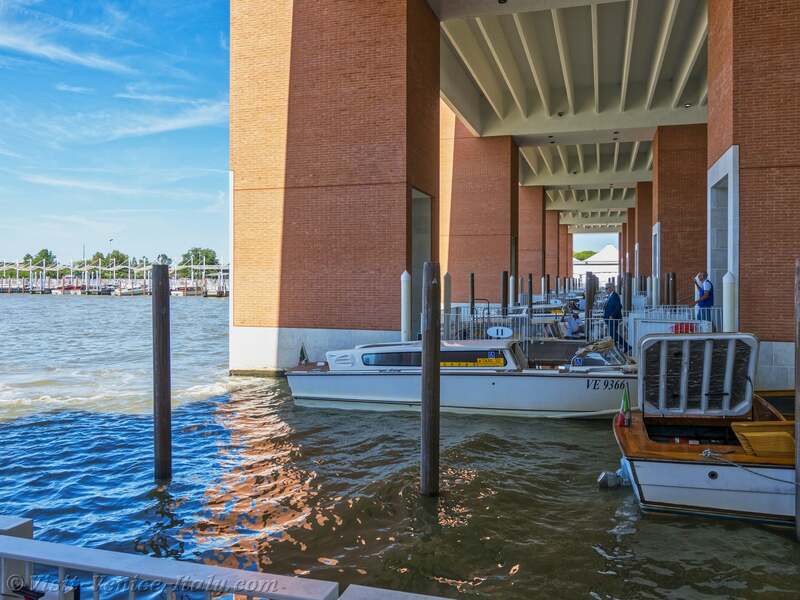 The distance from Marco Polo airport to Venice train station: It is precisely 12 kilometers from Venice by the road and 10 kilometers by boat across the lagoon . Marco Polo Venice is 25 kilometers from Radicchio/Treviso, 35 kilometers from Padua, 45 kilometers from Jesolo and 65 kilometers from Vicenza. It is important to know these distances in kilometers because some airlines do not serve Venice Marco Polo, which can moreover be useful in practical terms. From London, Easyjet have direct flights to Venice Marco Polo Airport from Gatwick, East Midlands and Bristol. British Airways has a direct flight from London to Venice Marco Polo Airport. From Spain, you can come to Venice with Iberia. Apart it, from Europ, plan for a round trip ticket to cost between 100€ and 250€ per person in economy class. 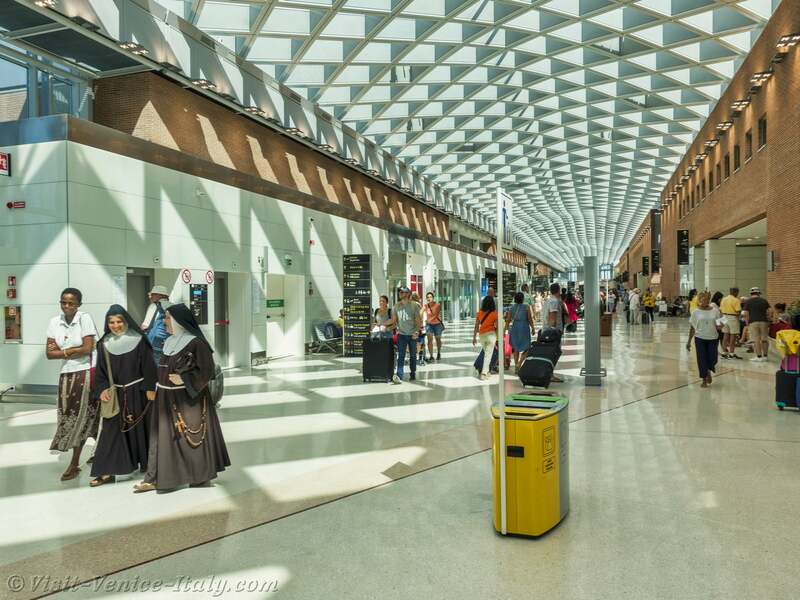 The Website (in English) of the Airport Marco Polo, with the complete list of all companies flying to Venice Italy from all over the world. Less romantic but quick, the bus will drop you at Piazzale Roma, the bus station located in the northern part of the city of Venice. ACTV bus take line number 5. The trip lasts a little less than half an hour and it departs on average every half hour. From the Airport-Venice, the first bus is at 4:08 AM, the last at 1: 10 AM. From Venice - Airport, the first is at 4:40 AM and the last at 12:40 AM. The exact schedules are available on the site ACTV. ATVO Buses: take Airport Shuttle. The quicker (about 20 minutes) of the two because, unlike the bus ACTV, the driver does not stop between the airport and Piazzale Roma. You can buy your ticket at the baggage collection area of the airport. The bus stop is right at the exit of the airport. Roughly every half an hour, from 5 am until 8:40 pm from Venice - Airport and from 8:20 AM to 12: 10 AM from Airport to Venice. Otherwise, if you prefer to arrive by the sea, you can take a boat from the company Alilaguna (On average 20€ from the airport in Venice. The Blue Line Alilaguna takes around 30 minutes to arrive at Fondamenta Nuove and one hour for San Marco. Red line takes a little more than one hour to the Armory, then another five minutes to San Marco and finally arrives at Zattere in Dorsoduro another 10 minutes later. Frequency is only of a boat every hour. Water-Taxis Pier You can also go to Venice by road, by way of the taxi (a 15 minute trip for 35€). On the contrary, distinctly better but rather extravagant, you can arrive in 30 minutes at Venice via the motoscafo, or the boat taxi. It is necessary you to foresee an expense of around 100 Euros to rent a Motoscafo to Venice. Make sure you also ask for total price (all passengers and lugguage included) before taking the Motoscafo, some boat taxi display tempting rates of only per passenger.